Pre-heat oven to 180 degrees Celcius and line a muffin tin or grease cups. Combine the flour, baking powder, bicarb and salt in a large bowl. In another bowl mash up your bananas, add in the sugar, the egg and the melted butter (make sure it’s cooled or you will cook your egg). 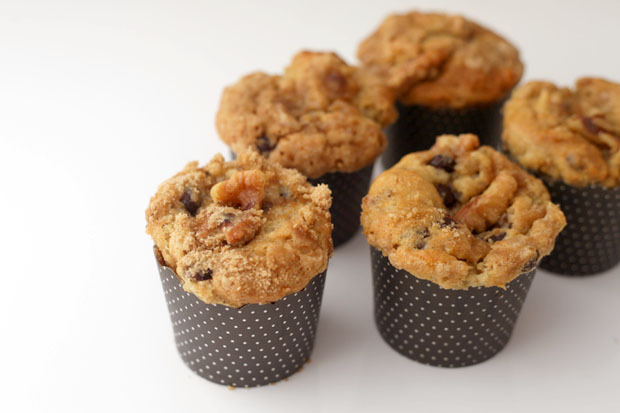 Fold the banana/sugar/egg/butter mixture into the dry ingredients, toss in your walnuts and choc chips too. 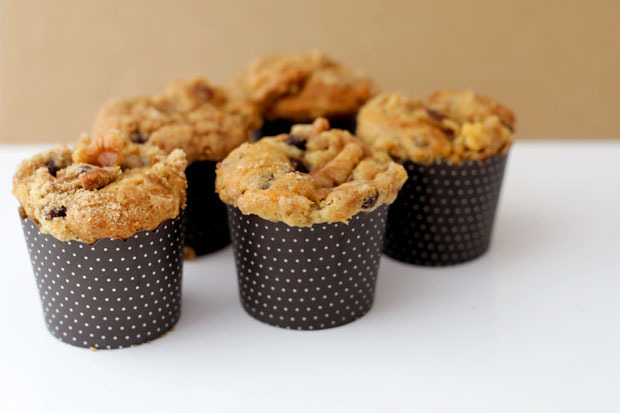 Put two tablespoons of the mixture into each of your muffin tin or cups. For the crumble topping, combine the sugar, flour and cinnamon in a bowl. Rub the butter through the dry ingredients with your fingers, it doesn’t have to be perfectly combined, just to make a rough and ready crumble texture, big bits and little bits of butter are fine. 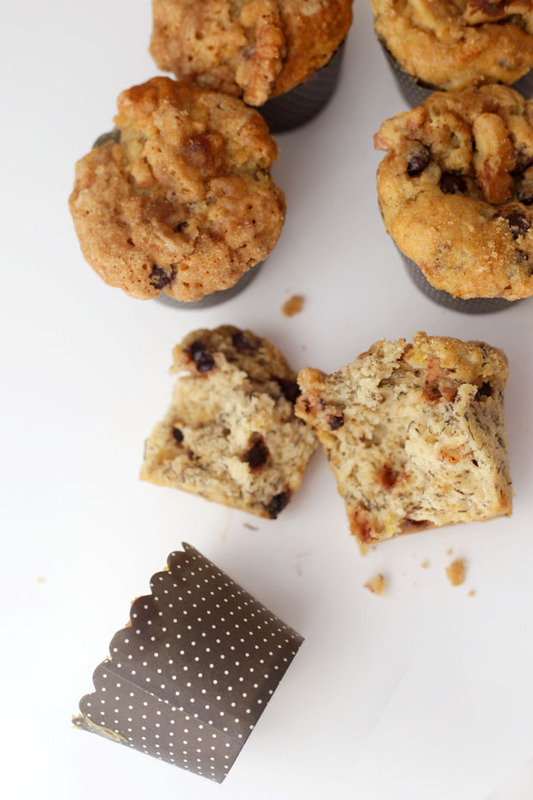 Sprinkle the crumble mixture on top of your muffins, topping with the extra walnuts. Bake for 20-25 minutes. 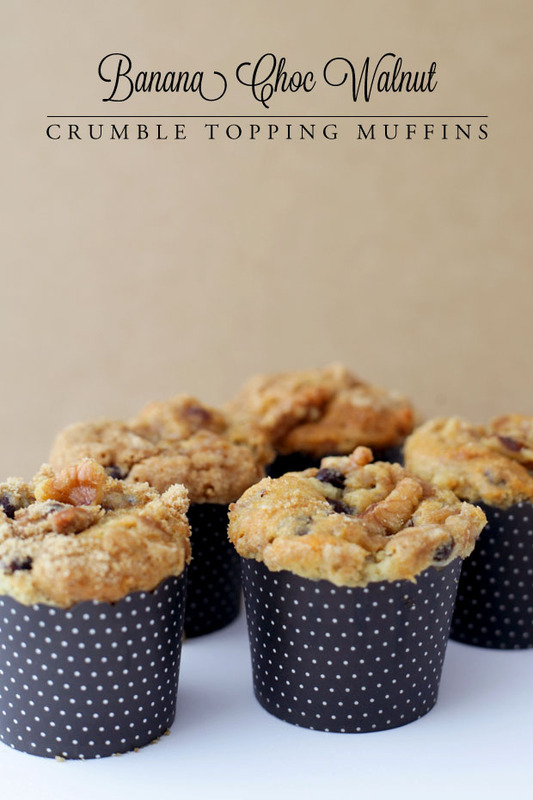 As my husband dearest says, in almost every instance, a crumble topping on one of my muffin creations ‘takes it to the next level’. I would have to agree with him. As always with a thrown-together-made-up creation I wasn’t sure if I’d get the ratio of wet to dry ingredients right to create the right texture, but seems to have worked a treat! I’m still not sure about the whole banana/choc/walnut flavour combination, could be better sans chocolate…or walnuts…or using grated apple instead of banana with the walnuts (no chocolate). Have a play! These look great. We always have bananas in the house (thanks to having a toddler) and I bake with them about once a week. It is hard to mess up a banana recipe!